This is a very common line that Japanese say after they take bath or after they get their hair cut or change out of their dirty clothes into clean clothes. ♦「いいお湯だった」( = Ii oyu datta) It was nice warm water! ♦「お先に！」( = Osakini! ) Thank you for letting me go first! You say this to a person who lets you go first or was waiting for you to finish something before them. = Osaki ni shitsurei shimashita. →We also say this to our coworkers if we leave work before them. OK, today we will use a TV commercial to learn Japanese. You will be surprised how much you can learn from such a short TV commercial. Did you know that lots of Hollywood movie stars routinely appear in Japanese TV commercials. This is one of my favorites. Tommy Lee Jones is an alien and he was sent to the earth, (in this case Japan), to do some research! It is part of a long running series of commercials. In every commercial he changes his job (presumably to help him do his research better). 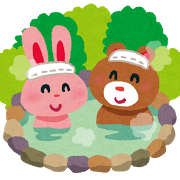 In this one he is working at a hot-spring 「温泉」( = onsen) hotel. =….Kono yukigeshiki ga kirei desunee. = This snowscape is so beautiful. =Kono wakusei no juunin wa onsen to yobareru basho ni kuruto..
=Tsurutsuru ni narimasu yo, kore! =Naze myou ni tenshon ga agaru no darou ka. = Uun.. Kuchi no naka ni amami ga paatto hirogatte desunee..
= Tada kono wakusei no onsen no takkyuu wa. = Bantou san, tadamono jya nai nee. ~中 ( = chuu) in middle of , verb + ing, during some action. = Maggie wa ima shokuji chuu desu. = Maggie is eating right now. = Shokuji chuu ni terebi wo mite wa ikemasen. = Maggie wa terevi wo miteiru massaichuu desu. = Maggie is right in the middle of watching TV. You can emphasize more by adding 真っ ( = mah) in front. Remember 真っ+ color in my color lesson? Japan has lots of volcanos and they have developed nice hot spring resorts all over Japan. = Aa…tsukareta onsen ni demo itte yukkuri shitai! Most of the onsens are public baths. (It considered sanitry and considerate to wash and rinse our bodies outside before stepping into the common (public) bathtubs.) We are not inhibited about taking off our clothes and becoming naked in a public bath. They are separated into 男湯 ( = otokoo yu) for men and 女湯( = onna yu) for women. Also there are 露天風呂 ( = roten buro) open air bath. While you stay there, you eat good food, take baths and drink and take more baths…Many people take baths three times a day, in the morning, before dinner and after dinner. = a dog called “Maggie-sensei”. Ex.あまり食べると太る ( = Amari taberu to futoru) If I eat too much, I get fat. = Haru ga kuru to atatakaku naru. = When spring comes, it will be warmer. = Seito tachi wa senesei ga kyoushitsu ni haitte kuru to shizuka ni naru. = When the teacher comes into the classroom, the students get quieter. = Maggie wa kirei desu ne. • つるつる ( = tsuru tsuru) We use it when we describe something smooth, like silky skin. = Kanojo no hada wa tsuru tsuru da. = Her skin is smooth. =Kono kuriimu wo tsukau to hada ga tsuru tsuru ni naru. = This cream makes our skin smooth. つるつる（ = tsuru tsuru) also is used for something slippery. = Yuka ga tsuru tsuru shiteiru kara ki wo tsuke te! = Be careful. The floor is slippery. •何故 ( = naze )　Why? = Aki wa naze myou ni monoganashiku naru no darou. テンション ( = tenshon) is originally from the English word, “tension”. But it differs in meaning. You will be surprised to see the amount of TV shows that introduce delicious or special food in Japan. That is called 「グルメ番組」( = gurume bangumi) Gourmet program. They introduce lost of nice restaurants in the city and local areas. There are special reporters for that kind of programs who are called as グルメレポーター( = gurume repootaa) We simply see them eating delicious food and they have to know how to describe the food in a professional way. 「~が口の中（一杯に）広がる」 ( = ga kuchi no naka (ippai) ni hirogaru) is one of the typical lines to describe the taste. Or 「この味はまったりしていて…」（ = Kono aji wa mattari shiteite.) It tastes very mild and…is another typical line for this kind of show. So this scene is funny because the customer sounds like one of the reporters. = Issho ni ~ wo yarimasen ka? = Issho ni ~ wo shimasen ka? What’s the difference between 「やる」( = yaru) and　「する」 ( = suru) ? They both mean to do (something.) Some says 「する」( = suru) is more polite than「やる」 ( = yaru) . That could be true in certain cases but usually 「やる」“yaru” is to do something more special than 「する」 ( = suru) . 私がやります。( = Watashi ga yarimasu. It is a very casual expression but everybody uses it. It means, “I did it!” “I made it!” ”All right!””Great!” or “Yes! !” We used it when things work out great. Do you want to do ~ with me? (together)? It is a useful phrase when you want to invite someone to do something with you. •温泉卓球 ( = onsen takkyuu) table tennis in a hot-spring hotel. Many of the big hot-spring hotels have karaoke, game corner and table tennis tables for customers. It is kind of old fashioned to play table tennis in hotels nowadays. There is a comedy movie called 「卓球温泉」 ( = takkyuu onsen) , hot-spring spas which have table tennis, about a group of people who want to promote an old hot-spring town using a table tennis tournament. As you can see in the video, people who stay in Japanese hotels can go anywhere in 浴衣 ( = yukata) (casual kimono) and they even play table tennis wearing 浴衣 ( = yukata). ただ者じゃないねえ..( = tadamono ja nai nee) : You add “ね(え)” ( = ne(e)) in conversation when you want to express your feelings or opinions. = Was the trip fun? = Goryokou wa tanoshikatta desuka? = Was your trip fun? Note: 素晴らしき ( = subarashiki) and 素晴らしい ( = subarashii) both mean “wonderful” and it can modify the nouns. = Nihon no onsen ni itta koto arimasuka? = Watashi niwa ondo ga takasugi masu ga, onsen ni tsukatta ato no gochisou wa oishii yo! = It is too hot for me but I will tell you that the meal after taking a bath is just delicious! Also, I found interesting the way the desire of “going to a hot-spring and just relax” is conveyed in the sentence. By putting the “shitai” at the end, does that make the “itte” to have the nuance of “wanting to go” as well, as in “ikitai”? Thank you sensei as always. Q 1) Let’s compare these two sentences. 1) 温泉に行きたい。 = I want to go to hot-spring. 2) 温泉にでも行きたい。= I feel like go to hot-spring. / I would like to go to a place like hot-spring. Difference 1) While you want to go to a specific place which is 温泉 in the sentence 1), you want to go to a place such as 温泉 in the sentence 2). When you connect two verbs with たい, you can omit the first one. Ex. I would like to have lunch with you and talk a lot. Maggiesensei, your lessons don’t help, they rescue. XD Maggie, this is clearer than water now. Holy crap – that’s a detailed analysis of a Japanese commercial! I’m just letting you know how much I appreciate all the effort that went into this. I’m in the ‘upper-intermediate’ phase where I’m trying to transition into native material, and this is super helpful. Thank you for the nice comment. It is one of my favorites CM series. So I am glad to hear you like it! Hopefully, I phrased it correctly, but if I did not, here is my question in English: When writing after a verb, what is the difference between “koto” and “mono”? Thank you, and your blog is extremely helpful! Excellent work, Yukari, Victor, and Maggie sensei! Ex. 寝る前に食べることはダイエットによくない。(=Neru mae ni taberu koto wa daietto ni yokunai.) Eating before you sleep is not good for your diet. Ex. うちには今、何も食べるものがない。(=Uchi niwa ima, nanimo taberu mono ga nai.) There is nothing to eat (no food) in my house right now. これは子供が見るものではありません。(=Kore wa kodomo ga miru mono de wa arimasen.) This is not a thing for kids to watch. 問題が有る If you meant “a question” use 質問 (=shitsumon) . -> 一つ質問があります。(Hitotsu shitumon ga arimasu.) I have a question. 問題(=mondai) means a problem or question for exams or tests. How can I say (to my 先生) that I enjoyed class (or that I learned a lot today)? That means you really enjoyed today’s class. Thank you very much. 今日のクラスも (=Kyou no kurasu mo)……. Your classes are always enjoyable (fun). It is very polite and considerate. お疲れ様です。（でした）(=Otsukare sama desu (deshita)) deshita : past tense. Both mean “Thank you for your hard work!” but the later, Gokurousama, is for when you address someone who work for you, like subordinates, assistants, handy man, delivery man, etc. お疲れ様です。(=Otsukare sama desu ) is more polite and it is used for someone superior to you. If you are not sure which to use, just stick to “otsukare sama desu” as many Japanese people do. Note: But there is a very casual way, ”お疲れさん”(=Otsukare san). You should avoid using it to your teacher. When someone says “osakini” to me, do I have to answer back something ? Koko ni mo, onsen ga arimasu, furui kazan no soba ni. Demo, koko ha sukunai desu. Kyou no lesson arigatou, Maggie sensei & Yukari san ! Ganbatte ne ! 疲れる(=tsukareru) “= to get tired”. グルメレポーターやりたいです！！！ヨーロッパの温泉は水着を着るって本当？(Youroppa no onsen wa mizugi wo kirutte hontou?) Is it true they wear swimsuit in Europe?